The TV segment has yet to see a profit, but restructuring will help ease the pain. However that comes at a price for Sony's workers. 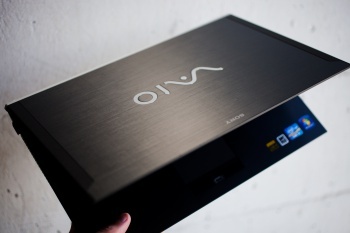 It's no longer a rumor: Sony will sell its PC business, passing on the VAIO brand. It intends to concentrate on smartphones and tablets, and can't afford to keep its PC business going. Sony expects to reach agreement with the buyer, Japan Industrial Partners, by the end of March 2014. Sony promises aftercare services for existing customers, but expects to pass on some of its PC division employees - about 250 to 300 people - to VAIO's new owner. Sony's Game Division is doing very well, after the successful launch of the PS4, and helped to push operating income up to Â¥90.3 billion ($860 million), an increase of 94.6% year-on-year. The Game Division increased sales by 64.6% year-on-year, for a total Â¥441.8 billion ($4.207 billion). Sony admits PS3 sales took a tumble, but isn't too worried about that given the circumstances. Sony's TV segment isn't losing nearly as much money as it used to, thanks to significant cost cutting measures. The TV division is still in the hole, and isn't expected to reach profitability in this financial year, despite Sony's previous high hopes. Even so, Sony's happy with its TV division; it's the number one brand in Japan, and claims to have the dominant market share in the US for 4K resolution TVs. It hopes, through further cost-cutting, restructure of the division, and innovation, to return its TV division to profitability in FY2014. But all this comes at a price. What with two of its most significant divisions either being sold off or restructured, there isn't need for as many staff. Headcount will be reduced by about 5,000, most of whom are overseas workers. Approximately 1,500 of those about to be fired will be Japanese workers. What of Sony's Pictures Division? Things are looking slightly better, since Captain Phillips and Cloudy With a Chance of Meatballs 2 did well, and of course Breaking Bad is Sony's darling right about now. But sales still went down year-on-year, which Sony attributes not to any real problem but because at this time last year it was counting the mountain of cash that Skyfall made, and anything else suffers by comparison. It also earned bumper TV loot from its home entertainment releases The Amazing Spider-Man and Men in Black 3 last year, and this year all it had to offer was White House Down and The Smurfs 2. None of its 2014 film releases really look like sure-fire winners either - this is the year of RoboCop, don't forget - which could indicate stormy weather ahead for Sony's Pictures Division.